Police arrested a self-proclaimed “mafia” member accused to knifing a rival on Pattaya Beach. 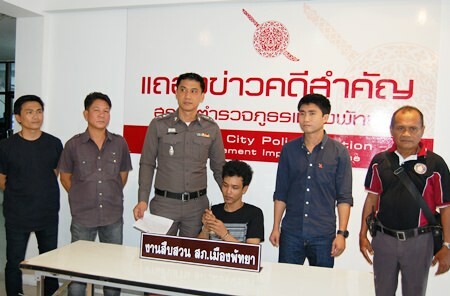 Pairoj Noypratum, 23, was brought to a police press conference June 8, three days after allegedly assaulting Weerasak Wanthong, 32, near the night bazaar market on Pattaya Beach. Police said Weerasak and three friends had confronted Pairoj as he sat on a bench around 4 a.m., punching him in the face. The suspect fought back, pulling small knife, stabbing Weerasak and then stomping on his face. Officers said the “gangster” finished the attack with a proclamation that Weerasak “had messed with the wrong guy. Pairoj Noypratum, claiming to be “mafia”, has been arrested for stabbing a rival with a small knife, which he holds up for the media. Police alleged Pairoj was a well-connected gang member who was suspected in a string of assaults and other crimes in an attempt to establish his “hard man” reputation. Now he will be putting that reputation to test behind bars.